I work with 4th and 5th grade inclusion students with special needs. 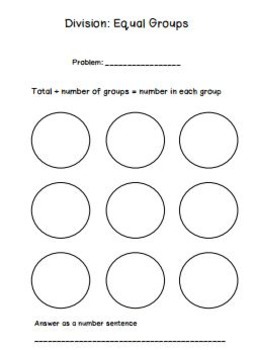 I have attached a copy of the work mat I use to help introduce the concept of division and the strategy of using equal groups to solve simple division problems. 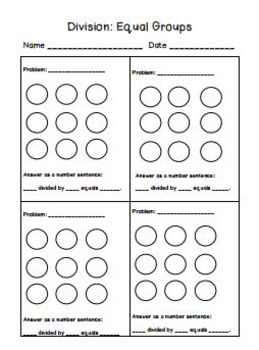 I print off a copy of the work mat for each student and slide it into a write and wipe erase envelope so students can use the graphic organizer to help with organizing their work. I model for students and the students follow along by filling in the blanks. The attached work mat works for equal groups for divisors up to 6. After the mini lesson I give students the attached independent practice to do on their own and I fill in division problems based on their skill level and understanding.